There always needs to be direct and clear communication between the institute and students for efficient administration of an educational organization. An organization needs to understand the needs and problems of its employees or students so that it can run smoothly without any hassle. It needs to address their issues swiftly and efficiently to be fair on both sides. Understanding the nature of such a useful system, ECAS (Enhanced Campus Automation System) was designed which could include the basic elements of a management system into a web based school management software. Complaints and redressal system is one of the most fundamental part of an organization and so a separate module has been designated in the software. This can be found in the student dashboard interface as Report Issue tab. In this panel, you have multiple fields like member type, branch, report issue to, subject of issue and type your issue here. 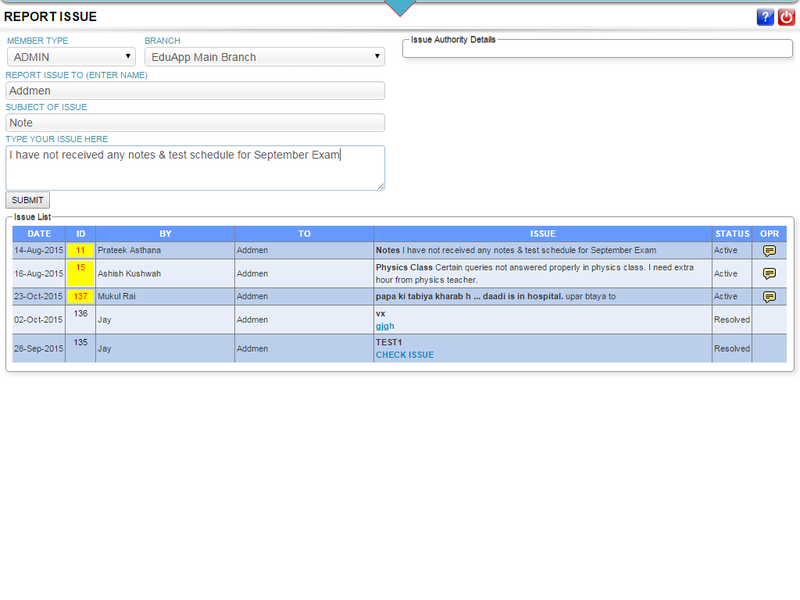 With the help of admin rights and permissions, you can designate limited departments specific to a particular student. This ways you can keep the issues department specific to students. You also have an option to select the concerned department in the branch menu to which you want to report to. You have a subject header and a separate box to type your issue in detail. Once you click on submit, it is reported to the assigned authorities and is visible on its dashboard. Once the issue is viewed and resolved, the solution can be viewed by the complainant as well. Sometimes students are not comfortable talking directly to their seniors out of respect or fear. This tool can prove extremely beneficial in such circumstances. There are times when students might be unhappy with the management of particular staff or department like maintenance, facilities, canteen, etc. These are common issues which can be reported directly to the concerned department through the complaints panel of this university management system software. There is always a help desk in the office administration but it can serve only a limited no. of students in one day. Through such college management software, issues of large no. of students can be addressed and resolved by the department to which it has been reported. ECAS is the most flexible school management software as it is 100% client customizable. Having such useful elements in your school management information system for communications can help an institute to grow to its highest potential.